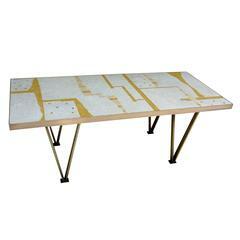 Coffee table from the studio of California Modern furniture craftsman Frank Rohloff. The table top is black resin with a lattice work of walnut veneer pieces set in a field of cast black resin creating an interesting juxtaposition of materials bordered by a walnut outer edge. The bases are carefully chosen slabs of black walnut shaped and polished and then placed so to accentuate the contrast of black resin to the natural grain of the wood The table has been professionally restored and is in excellent condition. We have matching end tables available in a separate listing. this table has been professionally restored and is in excellent condition. - Coffee table from Denmark. Coffee table in walnut designed by Finn Juhl and manufactured in the 1960s. The table is in great vintage condition. 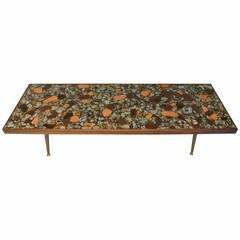 California modern walnut and iron coffee table, American, circa 1950s. Nice design for this coffee table made of wood and glass. Stateroom by Stonehill stamp. Excellent condiction. Great manufacture. Measure: H 46 cm / 40 cm / 35 cm diameter: 50 cm.